Stumptown Images— Out of sight out of mind? As a continuation to my previous article about how tolerance has made Portland intolerable. 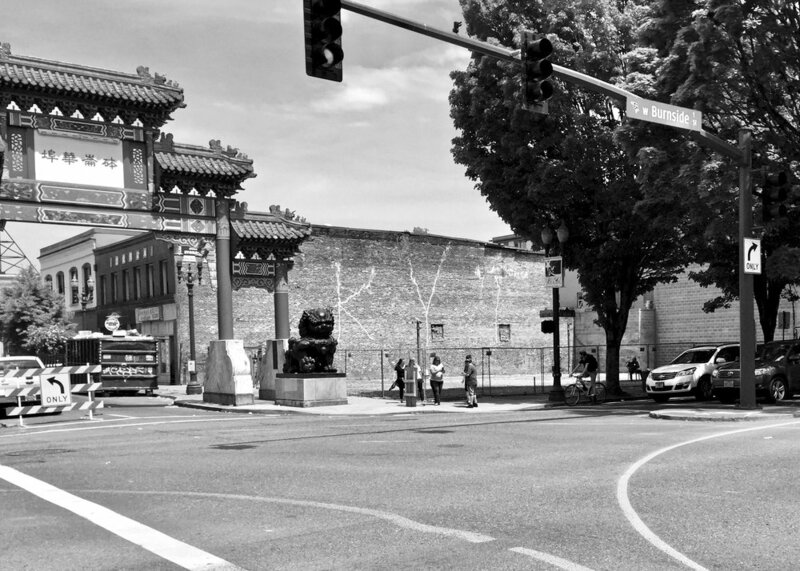 The City of Portland recently enabled the Right to Dream Too (R2D2) homeless camp to move from the gate at the entrance of China Town to a city owned parking lot near the Rose Quarter in Northeast Portland. Portland State University has designed and built a tiny home village for homeless women in the Kenton Neighborhood of North Portland. These are great steps for helping the homeless and putting them on a path of success. However, there is still a lot of work to be done. In Old Town and China Town, where the majority of the homeless live, the police are still having to make daily sweeps through the neighborhood to wake the homeless sleeping in doorways and porticos. When I do drive to work, my early morning trip down Everett Street can be a game of Frogger as I dodge the homeless crossing against the light, some of them are aggressive and overly intentional about it. After parking, the walk from the parking lot to the building can often be a challenge. I've walked past men and women in mental crisis, yelling at everything they see, including me and other pedestrians walking to work. I've had to step over feces, and often wonder if its human or dog. Feces should not be on the sidewalk and no one should have to wonder which species it belongs to. The small homeless camps that are built overnight often spill into the sidewalk restricting passage. I've had friends tell me that they've been harassed by individuals for refusing to give them money or food. Tourists I've brought with me or have helped find their way downtown have all asked why there are so many homeless. I typically tell them that it is tolerated, and with a sheepish grin and shoulder shrug I tell them "Its Portland." Many of them then indicate they won't be returning. With the Rose Festival in full swing this weekend and the growing tourism industry in Portland, this is something that we don't want to hear from visitors to our city. These new camps have moved some of the homeless out of downtown. Out of sight out of mine, right? I'm not so sure. Granted, I'm happy that the R2D2 is no longer in Old Town/China Town. But, simply moving a small part of the problem out of the area is not addressing the issue. As I heard on one of the news reports, the patrons of the new R2D2 camp still intend to "commute" to the area to access social services. Thus the problem has not been solved, and has only been moved to a differtent location. Given the current polical climate we also have another problem. The current administration has made the use of migrant labor in our agricultural industry scarce. I know of at least one farm in Washington County that has an existing camp built to host migrant workers. So I ask the following question to start a conversation. During the Great Depression, poor farms were located throughout the country to provide individuals with a place to work and live. They worked the fields in return for room and board and in some instances earned a small paycheck to help get them back on their feet. In 2017, is it unreasonable for us to set up the same program using existing infrasture designed for the migrant workforce that may not be coming back?